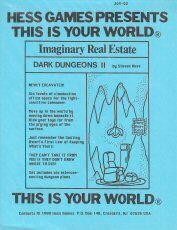 Packets of maps for Dungeons & Dragons, Advanced Dungeons & Dragons, or any fantasy role playing game. Interested in a little elbow room? 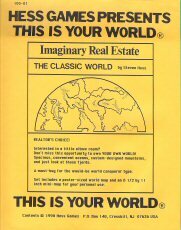 Don't miss this opportunity to own YOUR OWN WORLD! Spacious, convenient oceans, custom-designed mountains, and just look at those fjords. A must-buy for the would-be world conqueror type. Set includes a poster-sized world map and an 8 1/2 by 11 inch mini-map for your personal use." "MAKE YOUR HOME YOUR CASTLE! Triangular-design castle features enclosed yard, finished dungeons, and sleeping quarters for 500. Fabulous view of all the surrounding peasantry. Fifty-foot towers and many convenient arrow slits make this home its own security system. 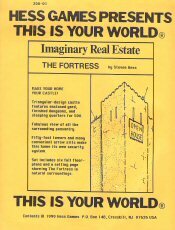 Set includes six full floor-plans and a setting page showing The Fortress in natural surroundings." This lovely one-bedroom, 140-laboratory hideaway features the privacy you crave plus closet space for all those messy material components. Long narrow corridors give the resident mage the edge over unwanted guests. 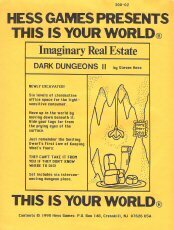 Other features include a teleport-access vault and indoor dragon parking. 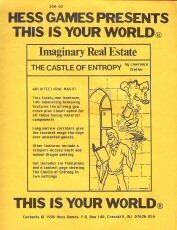 Set includes six floorplans and a context page showing The Castle of Entropy in two settings." Twenty defensive towers and 200,000 cubic feet of stone wall make this rectangular beauty safe and cozy. Live in a style reminiscent of the great citadels of history. Move in, and find out what it's like to be collecting taxes instead of paying them. 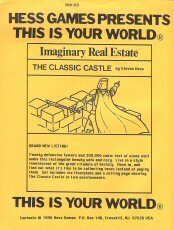 Set includes six floorplans and a setting page showing The Classic Castle in two environments." Luxurious manor house includes impressive master suite, rooms for up to 60 guests, and attached stables. Features include 3-story great room with beamed ceiling and a landscaped, enclosed yard with pool. 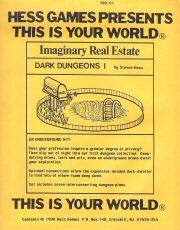 Two dungeon levels included for all your professional and recreational needs. 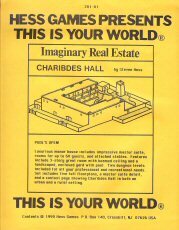 Set includes five full floorplans, a master suite detail, and a context page showing Charibdes Hall in both an urban and a rural setting." Does your profession require a greater degree of privacy? Then slip out of sight into our first dungeon collection. Deep-delving mines, lairs and pits, even an underground arena await your exploration. Optional connections allow the expansion-minded dark-dweller to find lots of elbow room deep down. Set includes seven interconnecting dungeon plans." Six levels of clandestine office space for the light-sensitive consumer. Move up in the world by moving down beneath it. Hide your toys far from the prying eyes of the surface. THEY CANT TAKE IT FROM YOU IF THEY DONT KNOW WHERE TO DIG! Set includes six interconnecting dungeon plans." Looking for a nice neighborhood for a business or residence? 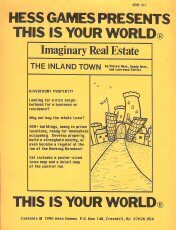 Why not buy the whole town? 400+ buildings, many in prime locations, ready for immediate occupancy. Develop property, build a stronghold nearby, or even become a regular at the Inn of the Barking Reindeer! Set includes a poster-sized town map and a detail map of the central inn." 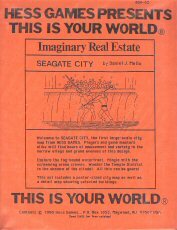 "Welcome to SEAGATE CITY, the first large-scale city map from HESS GAMES. Players and game masters alike will find hours of amusement and variety in the narrow alleys and grand avenues of this design. Explore the fog-bound waterfront. Mingle with the screaming arena crowds. Wander the Temple District in the shadow of the citadel. All this can be yours! This set includes a poster-sized city map as well as a detail map showing selected buildings."